Once again I am extremely grateful to Cliff Marchant and Andrew Crawford for their time and encouragement in the preparation of these three posts. In October 2003 Cliff and Dianne Marchant decided that they would sell two-thirds of the company to enable Soundsair to achieve to its full potential. This led to Andrew Crawford and Steve Handyside investing Soundsair and the formation of a new company, Sounds Air Travel And Tourism Ltd. 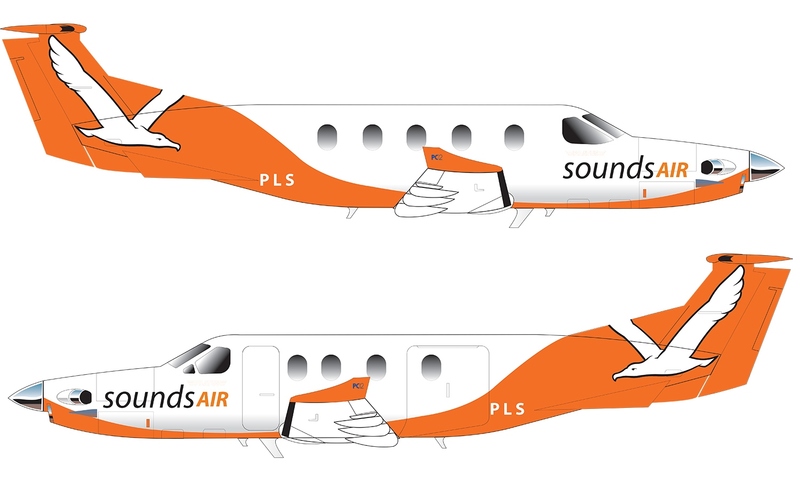 In December 2003, with Andrew Crawford appointed as Managing Director, the first changes appeared with the change of the name from Soundsair to Sounds Air and the adoption of the current albatross logo and orange colour scheme. 2004 began with a new Gippsland GA8 Airvan, ZK-KLC being added to the fleet and this replaced Britten Norman Islander ZK-REA. On the 19th of July 2004 Sounds Air started twice daily services between Wellington and Kaikoura. The new Airvan was the mainstay of the Kaikoura service but the Caravan was also used if a larger aircraft was needed. 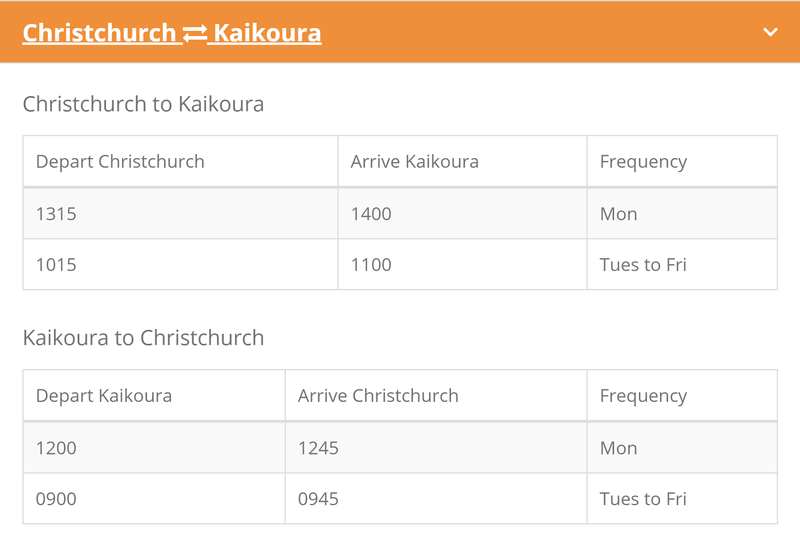 While the Kaikoura service continued for a number of years it was never the success the company hoped for and by May 2009 services to Kaikoura had ceased. Another of Andrew Crawford’s innovations was to form Skydive the Sounds Ltd with Neil Bradley and Callum McGlinchy in 2004. This increased the utilisation of Sounds Air’s Cessna 206 and smaller Cessna 172. 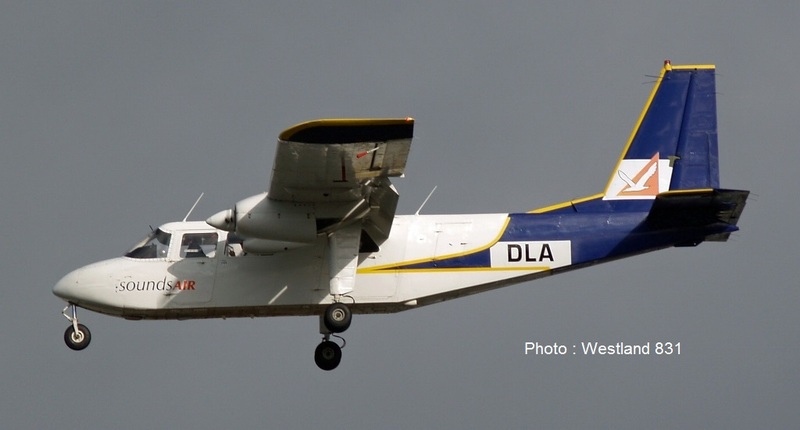 In mid-2006 a 10-seat Britten Norman Islander, ZK-DLA, was added to the fleet. While this was cheaper to purchase than a Caravan the operating costs were a lot higher and it was sold to Mountain Air the following year being replaced by a larger Cessna 208B Grand Caravan ZK-SAA. In July 2007, in partnership with Craig Anderson, the company bought Aeromotive (Blenheim) Ltd, an Omaka-based aircraft maintenance company and renamed it Sounds Aero Maintenance. During 2007 the company also extended the runway at Picton’s Koromiko airport and the existing house was redeveloped into a new terminal building. Britten Norman Islander ZK-DLA (above), on approach to Wellington on 13 September 2006, was replaced by Cessna 208B Grand Caravan ZK-SAA seen below taxiing to the terminal at Wellington on 3 April 2014. Sounds Air’s network started to expand when the company took over flying the Dominion Post newspaper from Wellington to Blenheim and Nelson on the 9th of January 2006. Initially the flight operated from Wellington to Nelson via Blenheim with a direct flight back to the capital but from mid-2007 both Nelson and Blenheim received their own dedicated newspaper flights enabling an early morning flight to Wellington from both centres. In November 2007, with the arrival of the Grand Caravan, the company added an evening flight between Wellington and Nelson and return which operated on four days a week. A third Cessna Caravan, ZK-TZR, entered Sounds Air service on the 3rd of October 2008. In the same month the company opened a counter in the main Nelson airport terminal increasing both the company’s profile and passenger loadings from Nelson. Part of Sounds Air’s appeal is the pricing system which is set at a reasonable level and where a ticket costs the same whether it is bought months or days before travelling. Further expansion to Nelson services occurred in April 2009 with the take-over of Nelson-based Flight Corporation Scenic which provided a range of scenic flights, flight packages and private charters from Nelson. This led to the Cessna 206 being based at Nelson. 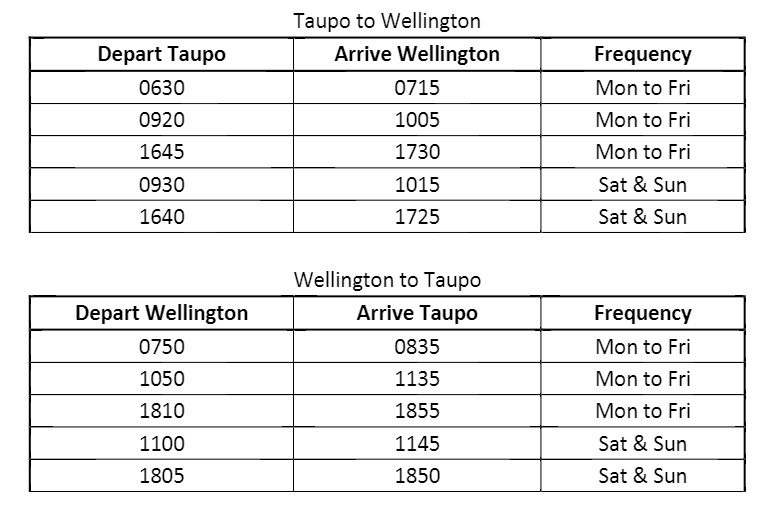 Additional services between Nelson and Wellington were added in May and November 2009, February 2010, September 2011 and November 2013 so that today there are 23 flights per week. Sounds Air’s services to Blenheim, like the services to Nelson, began with the introduction of the Dominion Post service on the 9th of January 2006. Evening services to Blenheim were introduced on the 11th of April 2008 when Sounds Air began services between Wellington and Blenheim on Fridays and Sundays nights. These flights rapidly gained popularity and additional flights on Monday and Wednesday evenings soon followed. A major expansion to the Blenheim service began on the 1st of August 2011 when Sounds Air added 13 extra return flights a week to and from Wellington in addition to the 10 weekly return flights it already operated. Further flights to Blenheim were added in August 2013 and September 2014 so that today there are 33 flights per week. September 2009 saw Sounds Air add a 2000 model Cessna 172, ZK-SAN, to the fleet. This Cessna was IFR equipped and GPS certified enabling it to be used for instrument training and IFR endorsements. In 2010 the company moved to establish an airpark at Picton Airport offering 16 freehold residential sections on farmland it owned behind the airport in Koromiko. In May 2013 Sounds Air added a second Cessna Grand Caravan to the Fleet. ZK-MJL had previously been operated by Salt Air and Air Milford and it was re-registered as ZK-SAY when it became part of the Sounds Air fleet. This has enabled Sounds Air to offer the possibility of dedicated freight flights as well as to offer more charter flights and extra flights at peak times, especially over weekends and during the summer season. In September 2013 Air New Zealand announced that it was going to withdraw its Auckland to Masterton and Wellington to Wanganui services. Sounds Air explored the possibilities of connecting both Masterton and Wanganui to Wellington but in the end the company favoured Wanganui as the most viable option. 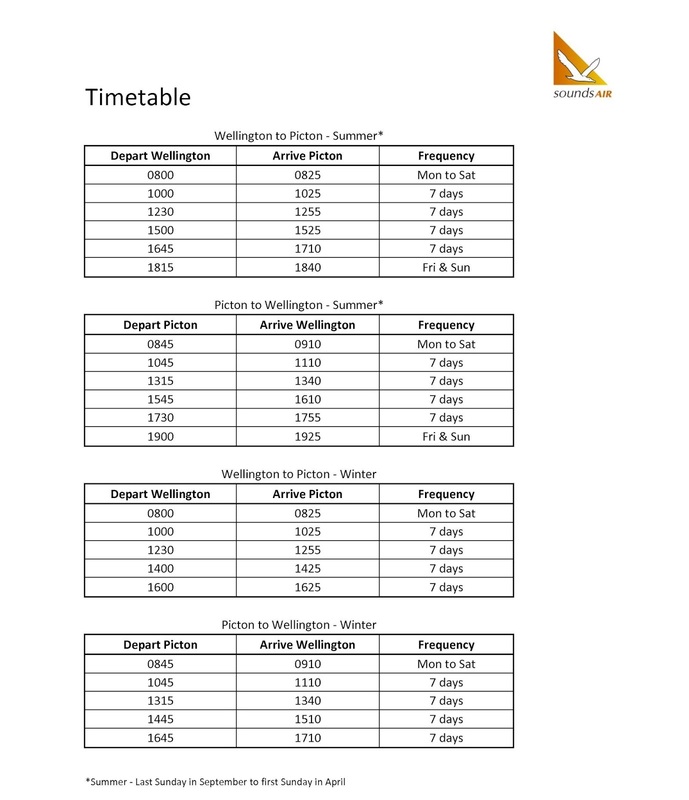 A six day a week service between Wellington and Wanganui began on 21st of January 2014. An early morning service is flown to Wellington Monday to Saturday and a return service to Wanganui is flown Sunday to Friday. In February 2014 Cessna 206 ZK-ENT and Cessna 185 ZK-PRM were registered to Pelorus Air. The new company has taken over the small piston aircraft and small airstrip operations which have been progressively wound back by Sounds Air in order for them to focus on the all turbine, mostly IFR Caravan operations. Pelorus Air is separate to Sounds Air, but shares the use of Picton Airport to connect to the remote airstrips in the Sounds. 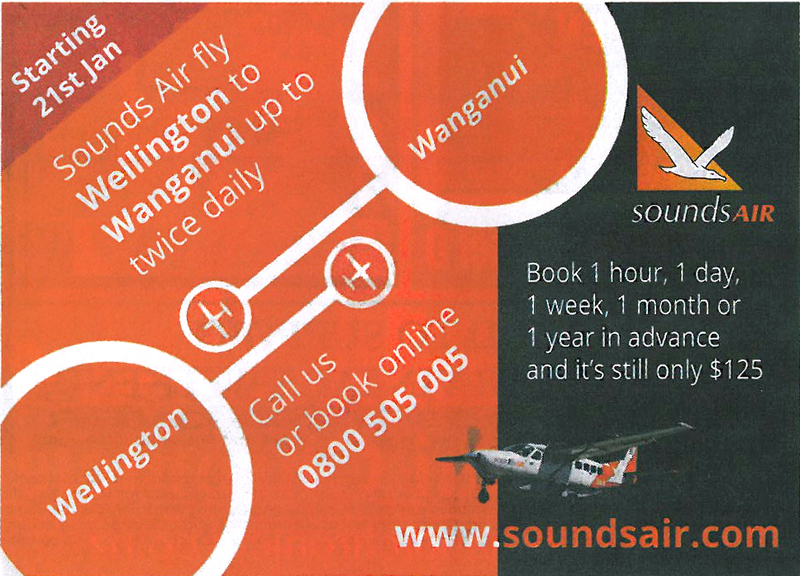 From the 1st of September 2014 Sounds Air doubled its weekday flights Wanganui to two flights a day. 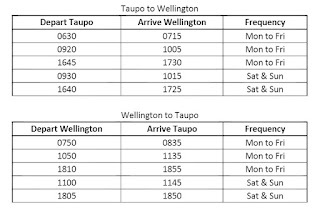 Southbound flights depart Wanganui for Wellington at 6.30am and 3.30pm Monday to Friday and at 4.00pm on Sunday afternoons. 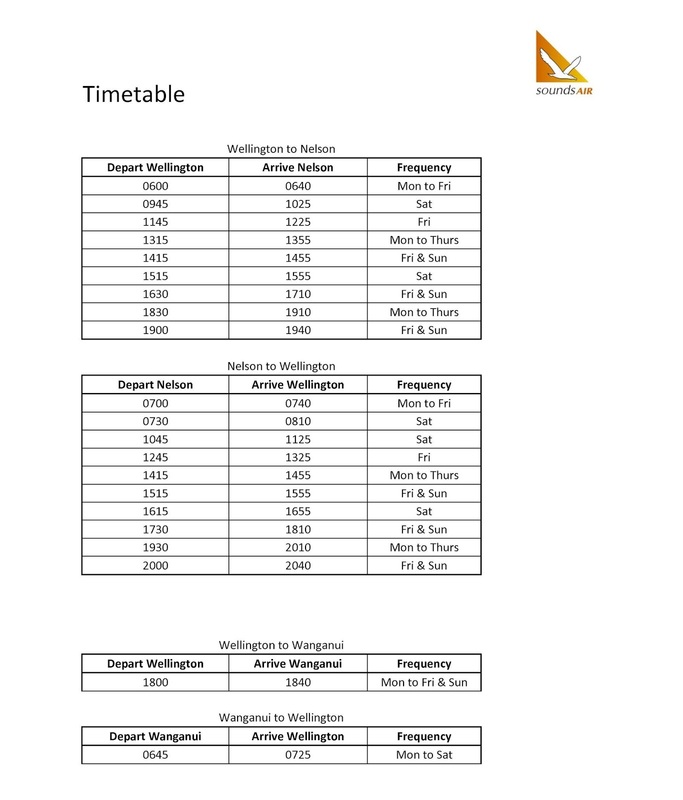 The northbound services depart Wellington at 9.30am and 7.30pm with a 7.00pm flight on Sunday evenings. 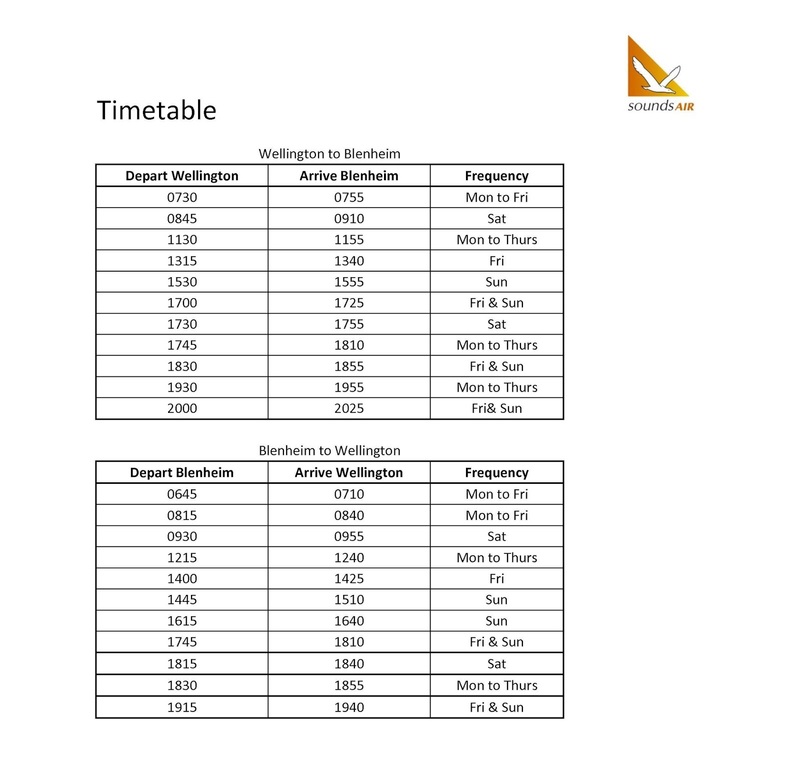 All the Wanganui flights connect with Sounds Air flights to and from Picton, Blenheim and Nelson both in the morning and in the evening. The additional flights were not successful and the schedule was reduced to a single flight each day in early 2015. In January 2015 a third Cessna Grand Caravan, ZK-SAW, was added to the fleet and from the 26th of January 2015 a new Blenheim-Paraparaumu service was offered. Three flights a day, each weekday were scheduled with a return flight on Sundays. Air New Zealand's withdrawal from Westport and the Wellington-Taupo route enabled further expansion for Sounds Air. The company made six-year agreements with the Buller and Taupo District Councils whereby the local council guarantees the first three seats per flight. To service the routes the company purchased two Pilatus PC-12 aircraft. The first to arrive was ZK-PLS and this inaugurated air services from Westport to Wellington on the 28th of April 2015. 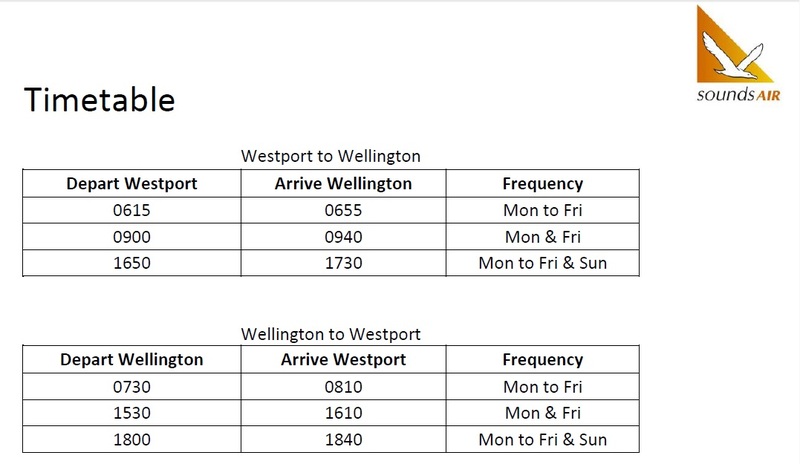 Sounds Air fly between Westport and Wellington daily, except Saturdays, offering 13 return flights each week. Mondays and Fridays, the busiest days of the week, feature three return flights. On Tuesdays, Wednesdays and Thursdays there are two return flights. On Sundays, Sounds Air offer a late afternoon return flight. On the evening of 15 May 2015 Sounds Air bowed out of Wanganui. The last flights, Wellington-Wanganui (SDA 63) and Wanganui-Wellington (SDA 64), were flown in Cessna Grand Caravan ZK-SAA under the command of Jason Eteveneaux. Sounds Air commenced Taupo to Wellington flights on 2 June 2015. Three return flights are operated each weekday with two return flights being operated on Saturdays and Sundays. The first flight, (SDA 803) was operated by Sounds Air's second Pilatus PC-12 ZK-PLZ under the command of Craig Anderson. Also on the flight deck was Sound's Air's Chief Pilot Willie Sage. Pilatus PC12 arrives at Taupo for the first scheduled flight to Wellington on 2 June 2015. On 15 June 2015 Sounds Air introduced Paraparaumu-Nelson services. The first flight was flown by Tim Johnson in Cessna 208B Grand Caravan ZK-SAY. Two return flights a day are operated on weekdays and one on Sundays. 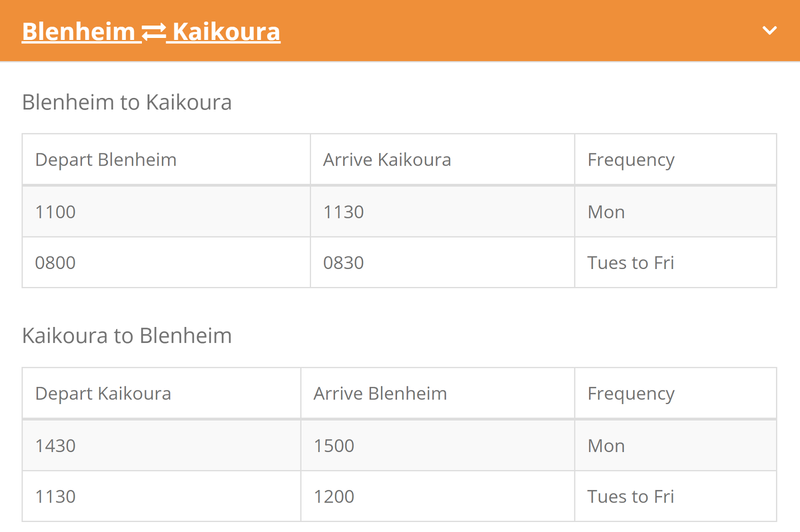 At the same time the Paraparaumu-Blenheim service changed to the same frequencies. 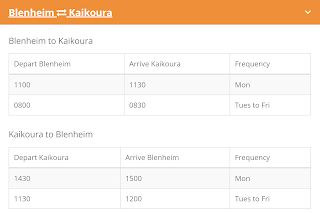 From the 6th of September 2015 the Tuesday and Thursday flights on the Blenheim-Paraparaumu-Nelson. Sounds Air's third Pilatus PC-12, ZK-PLT, entered service on the 14th of September 2015, this being the first Pilatus to wear full Sounds Air colours. Sounds Air commenced another new air route between Blenheim and Napier on the 5th of November 2015. The inaugural services, northbound SDA712 and southbound SDA713, were flown in Pilatus PC-12 ZK-PLZ under the command of Tim Johnson. 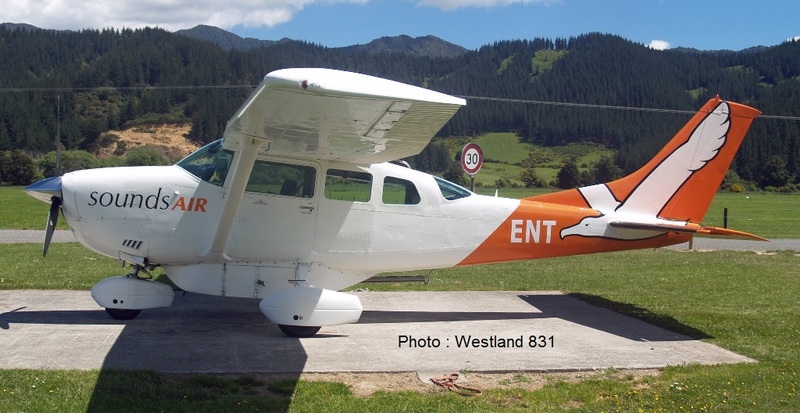 Three passengers flew to Napier with eight on the return flight to Blenheim. A fourth Pilatus PC12, ZK-PLX, entered service May 2016. 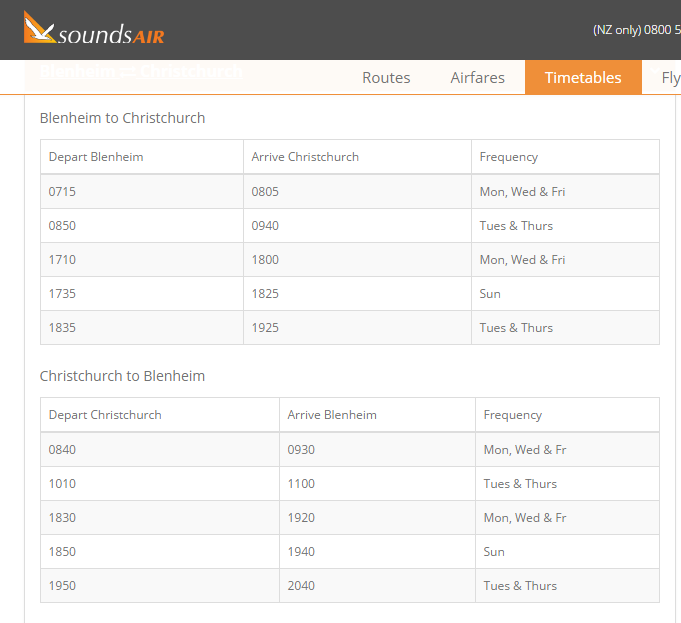 Sounds Air commenced a new service between Blenheim and Christchurch on the 1st of August 2016 following Air New Zealand withdrew from the route the day before. Pilatus PC12 ZK-PLX was used for the first flights, SDA651 to Christchurch and SDA652 back to Blenheim. These were captained by Craig Anderson with Dave King as co-pilot. Eleven flights a week are offered between the two centres. In August 2016 Pilatus PC12 ZK-PLZ was repainted and reconfigured for corporate and charter work. After the Kaikoura earthquake on the 14th of November 2016 Sounds Air reintroduced services to Kaikoura with a Monday to Friday Blenheim-Kaikoura-Christchurch service beginning on the 21st of November 2016. The Kaikoura-Christchurch sector ceased operating on the 27th January 2017 after the highway to Christchurch was reopened. 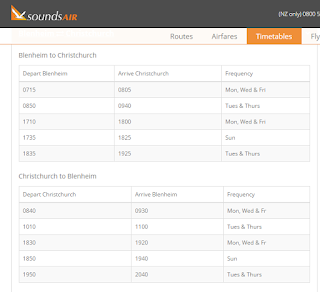 Sounds Air have committed to operate the Blenheim-Kaikoura service until the end of 2017. 2017 saw the arrival of Pilatus PC12 ZK-PLV in service giving Sounds Air a fleet of five Cessna Caravans and five Pilatus PC12s. Pilatus PC12 ZK-PLV at Wellington on 28 October 2017. By November 2015 the Wellington to Nelson route had become Sounds Air's second busiest route with 26 flights a week operating between the two centres. The arrival of Jetstar on this route in December 2015 and the resulting air fare war seriously impacted on Sounds Air's traffic and by August 2017 the frequency of services had reduced to 17 flights a week and the route had dropped to become the sixth busiest. On the 29th of December 2017, following the reopening of State Highway 1 north of Kaikoura, Sounds Air discontinued the Blenheim-Kaikoura air service. The final flights, SDA31 to Kaikoura and SDA34 back to Blenheim were flown under the command of Tom Williams in Cessna Caravan ZK-SAN. Sounds Air is an airline that has grown from finding its niche as a charter carrier to the remote areas of the Marlborough Sounds to being a regional commuter airline offering reliability, safety, a good timetable, good fares, a good relationship and reputation with passengers. In 2017 the airline flew 110,000 passengers last year and is currently evaluating the purchase of Beech 1900s. The present structure of the company will continue to provide a solid foundation for further expansion in the years ahead. Another great post once again Steve, love reading about the history of these true "other/heartland airlines" of nz:-) what are the possibilities of sounds air growing to the extent of upgrading to a Q300? Thanks for your comments... It is great to hear from people who are enjoying the blog. I can't see Sounds Air getting to Q300... they are a niche operator and I don't think they would want to go head to head with Air NZ. What I can see is them stepping into the gaps created by Air NZ's departure... Wanganui-Wellington for example, though I suspect it will take Wanganui commuters a while to see the advantage of the Sounds Air service but a reasonable, stable air fare no matter when booked makes it a very attractive alternative. In the same way Wanganui passengers to Chch, Dunedin etc will have to get used to interlining with Air NZ and Jetstar at Wellington. But I think it has the potential to be a great service! Hawera is another potentially interesting niche destination though with flights to Wellington and or Auckland not New Plymouth. Air2there operates regular schedules from Paraparaumu to Blenheim and Nelson - the Wellington-Blenheim services only operate 3 days a week. Are they still code sharing with Sounds Air??? I thought that was short lived. I don't think there is any real potential to expand from their existing routes unless they establish another base. Thanks Steve for the post. Do you have any idea which CAR Part Sounds air operate under. I'm assuming part 125 due to the SEIFR? Air New Zealand's newest jets..
Where on earth is Vincent's VAB? The Q300 koru... Which is your choice?